Of the many musical genres birthed in the States, trap has lent itself especially well to the development of a genuinely international and de-territorialized sound, magnetically attracting more traditional sonic cultures and styles across the globe. Morocco’s ‘trap’ scene in particular is remarkably robust; in a country lacking serious music industry infrastructure, a growing number of trap artists have found major local popularity, blending Auto-Tuned vocals delivered in Arabic and classic TR 808-generated beats with elements from traditional music such as the Algerian-born raï. Among these artists is Issam, an eccentric, effortlessly stylish 25-year old Casablanca native and self-described “child of the internet,” whose songs and videos offer a lens onto contemporary Morocco's urban culture. Issam has gained fame with releases such as “Hasni,” his tribute to the legendary raï performer Cheb Hasni, “Rolex,” and “Bavra,” an exuberant club track that has garnered nearly two million YouTube views to date. Today, he’s debuting “Caviar,” which finds Issam in a more sentimental register, lamenting experiences of cultural exile over a Hasni-sampling beat by French producer King Doudou. 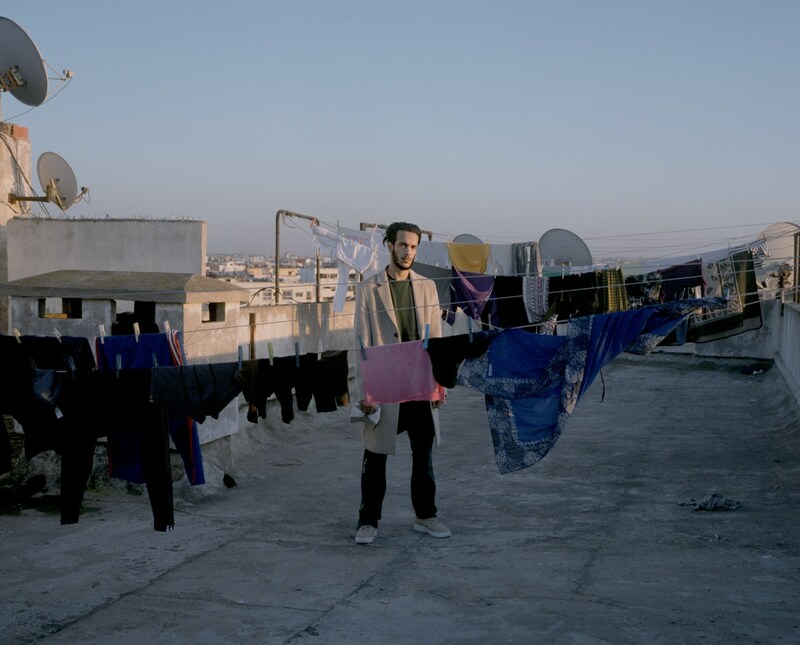 The “Caviar” video, produced by Paris-based Arab arts collective NAAR, extends this melancholic atmosphere, with Issam lingering in front of apartment bloc gardens, a barber shop, a public soccer pitch. Originally planned to be partially shot in Paris, the video’s somber tone mirrors Issam’s reality as a Moroccan artist, as his visa application was recently denied by the French government. The track and its video showcase an increasingly globalized scene in which Arab artists nonetheless remain peripheral participants, due in part to the significant political difficulties in bypassing borders and enjoying the freedom of movement granted to Western performers. “Caviar” will be included on SAFAR, an album of collaborations between Moroccan and European trap artists such as Shayfeen, Madd, Kaydy Cain to be released by NAAR later this fall. On a call linking Casablanca, Paris, and New York, I spoke with with Issam and NAAR co-founder Mohamed Sqalli to discuss the present and future of Morocco’s rap scene, the role of the Internet in establishing new genres, and the long-term goals of NAAR as a promotional platform for Arab artists in Europe. ISSAM: I'm 25 years old, I was born in Casablanca and have lived there since. Up until two years ago, I wasn’t really listening to rap — I was listening to lots of music on SoundCloud, which eventually led me to a lot of rap. Listening to rap felt really good, so I thought to myself, "Why not record my own tracks?" I released “Taba Taba,” which people really seemed to like. That’s how I began to gain recognition, and it made me want to continue making music. Is there something specific about rap that's comparable to Moroccan or traditional Arabic music? ISSAM: Innovation is an essential part of music. There wouldn’t be any value in trying to make copycat versions of tracks by Travis Scott or Young Thug. I’m very inspired by these artists, but I’m more interested in making music that includes elements from my home culture in Morocco. I have a lot of pride in the music I’ve released so far, since I’ve created something original that blends these two cultures. Also, this kind of music is more appealing to an international audience. I’ll achieve more success at an international level if my music doesn’t sound like anything people have heard before. ISSAM: Last year, I released “Hasni,” which I think can be considered the first track combining trap music and raï. I continue that with “Caviar,” which was made through NAAR. The track was made in collaboration with King Doudou, who uses a sample of Cheb Hasni for the instrumental that I rap over. It deals with the theme of exile and the experience of living far from home. It’s a theme that’s very close to Cheb Hasni, and a concept that’s pretty universal across the Maghreb. It’s familiar to many people, since we’re all exiled from somewhere in some way. “Caviar” has to do with time and the distance that we have from our childhood. When we’re kids, everything appears to us like caviar — everything is delicious, wondrous, and super, but over time, everything spoils a bit. I want my listeners to experience an emotional impact when they listen to it. You've faced several political obstacles, including difficulties obtaining visas and crossing borders. Can you speak about some of your personal experiences? ISSAM: I had one very negative experience last April, when NAAR had invited me to perform at the Insititut du Monde Arabe in Paris. It was really confusing for me, since we spent a long time preparing the visa application and making sure we were following all the rules. I was extremely upset when my French visa application was denied. I don’t understand why Moroccans must take such enormous risks in order to travel. NAAR paid for my flights, I had support from the Institut du Monde Arabe, my hotel was booked. There was a general risk that was being taken by so many people, and I’m not even talking about emotionally. I don’t understand why Moroccan people have to continuously take these kinds of risks when foreign artists are able to travel to Morocco so easily. They can come here whenever they want. It’s a situation that’s insupportable, because in order to be successful I can’t only be a local artist. I was talking earlier about creating original music and the ability for the music to travel internationally — in order for this to happen, I need to collaborate with international artists, and this requires free movement [across borders]. Even though I’m an independent artist and up to this point have never left my home country, I see this act [of free movement] as essential. What do you see as the greatest barriers for Arab cultural production globally? ISSAM: In the past two years, there's been a huge artistic explosion in Morocco. There are real artists here who are so strong, especially in rap music. What all these artists have in common is that they are innovative. The main obstacle for Moroccan artists today is that there's no real music industry here, which means artists aren’t able to just focus on writing their own music — they have to focus on recording, mixing, shooting, and directing their own videos. This is normal for artists everywhere in the world, and it's work that I’m ready to do; the issue is that, right now in Morocco, it doesn’t feel like there’s a clear direction for artists to move in. It’s so fluid, and I’m not sure exactly where to go. This is all due to the absence of a music industry. I’m doing all of this because I love it, but I’m not really sure where it will take me. What are your main artistic goals? ISSAM: To create music that's as personal as possible. I want to be able to translate and integrate what makes Moroccan culture so rich into trap music. Right now I’m working with American beat makers that are better known and have worked with people like Young Thug and Drake. Working with these beats that sound very American, I’m trying to include a Moroccan element. I’m convinced that this is the way that I’ll be most successful. Mohamed, why did NAAR produce a collaborative rap album for their first major project? MOHAMED SQALLI: We founded NAAR to produce, promote, and support projects in partnership with Moroccan artists. Over the past five years, we’ve seen a growth of Moroccan art and culture throughout Europe, and we wanted to empower Moroccan artists in alternative ways. When making a decision about our first project, the idea of releasing a Moroccan rap compilation developed very quickly. Of all of Morocco’s artistic cultures, music has been the most interesting and active over the past twenty years — even more, truthfully! Moroccan music is powerful, it developed independently, it’s free and uncalculated, it’s not overtly political, no artist has authority over others, and Moroccan artists are super-talented. We thought it could reach a wide audience, especially if the collaborations were with international artists. With NAAR, what kind of platform do you hope to create for Moroccan and international artists? What's the role of the internet in all of this? SQALLI: The hope is that it will offer a platform for Moroccan and Arab artists to directly deliver their ideas and art to an international public without any mediating forces. There are a lot of people who want to take advantage of Moroccan artists who are making interesting music, trying to get them to sign bad contracts to profit off of their work. You get the sense that Moroccan artists are never at the center of the conversation and aren’t being given their due. We’re trying to give agency to Moroccan artists, so that their international profiles will rise and they'll be the first to benefit from their own success. Today, the best work in hip hop and rap is being done collaboratively. Increasingly, this is happening internationally. Italian rappers are collaborating with American rappers, or Japanese rappers. It’s mixing in a lot of different ways. Tracks are in several different languages — we see this with Cardi B tracks that are in English and Spanish! This kind of collaboration offers value to everyone, and this wouldn’t be possible without the internet. Trap is the most international movement in music, and this wouldn’t be possible without the internet.